Every year, residents of the small Amish community in Monte Vista, Colorado, look forward to the Ski Hi Stampede, the state's oldest professional rodeo. The rodeo is always good, clean entertainment for the hardworking farmers of the San Luis Valley. But this year, the Stampede turns deadly for one Amish man. Did rodeo fans see an unfortunate accident? Or something more sinister? Amish bishop Henry Lapp is known far and wide for his uncanny ability to draw and remember the smallest details of anything he's seen, skills that have served him well in past investigations. He was at the rodeo that day. The problem? He didn't see Jeremiah Schwartz's death. With a murderer on the loose and members of his community being threatened, Henry must act fast. But can he solve a crime he didn't see? This time around, Henry will have to rely on his keen sense of human character and observation, skills he's honed in his role as bishop, if he hopes to crack the case. Who the Bishop Knows is a story of accepting our talents, putting one another first, and trusting that God will care for His children. WHO THE BISHOP KNOWS by Vannetta Chapman. The Amish Bishop Mysteries book 3 Having read and loved the first two in this series, looking forward to this one. Local amature event, a shot fired, a boy 19 laid on the grounds. Henry goes to be with the grandmother, it was her grandson. Emma, if she was to be a bishop wife, was needed, also. Henry had a gift, a blessing he see's now, to draw what he can't remember. They contained the people but, no one recalls anything. Jeremiah had a phone, a world, unknown to the Amish, what would that reveal. He was leaving to go where, did Katie Ann have any idea, and now the girls were missing. A good plot, of how an event effects a community. They come together to help and heal. Readers will love this story as well as the series. All of Vannetta books are good, and looking for the next new series. Given ARC by Net Galley for my voluntary review and my honest opinion. 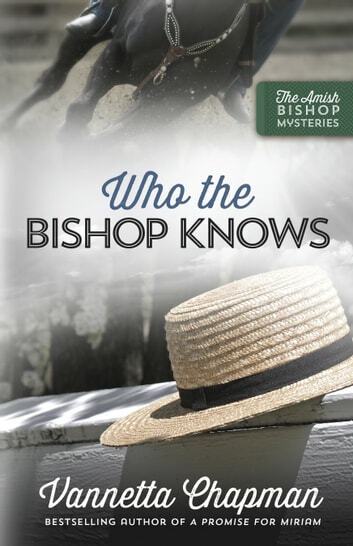 Who the Bishop Knows by Vannetta Chapman is the third story in The Amish Bishop Mysteries. Bishop Henry Lapp is attending the Ski Hi Stampede in Monte Vista, Colorado with his fiancé, Emma Fisher. Jeremiah Schwartz comes out of the chute to wrangle a steer and a shot rings out. Henry, who was obtaining refreshments, runs to check on Emma and notices Jeremiah on the ground. Unfortunately, Jeremiah does not survive the bullet wound. Jeremiah was visiting his grandmother, Ruth Schwartz for the summer to help her with farm chores, and he competes at local rodeo’s as an amateur steer wrangler. Who would want to harm Jeremiah? In the past, Henry has used his unique gift to draw scenes to help solve crimes. This time, though, Henry did not witness the shooting. Sheriff Roy Grayson will still need Henry’s help in speaking with Jeremiah’s friends and family as well as utilizing his observation skills and ability to judge a person’s character. They soon discover that Jeremiah had secrets and one of them could have gotten him killed. Can they catch the culprit before he harms someone else? Henry would like the crime solved before his wedding to Emma in three weeks. Come to Monte Vista one last time to help Bishop Henry Lapp solve Jeremiah’s murder and see the nuptials of this adorable couple. 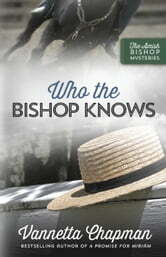 Who the Bishop Knows is the final installment in The Amish Bishop Mysteries. It can be read as a standalone since the author provides details on Henry’s ability, his relationship with Emma, and the mysteries from the previous two books. I do not feel, though, that the author had to keep mentioning the prior mysteries (the details were repeated several times). Who the Bishop Knows contains good writing and fluid transitions. I found the pace a little slow in the first half of the book. The story was not moving forward. The pacing does pick up later in the book. The mystery was interesting, but the culprit can be easily identified. How Jeremiah was murdered was unique (modern and out-of-box). I have not encountered it in a book previously. I do wish there had been more action. The investigation, for the most part, consists of questioning and speculation. The one thing I did not like was the transcript sections (a transcript of police interviews). They disrupt the flow of the story. Those sections remind me of reading a script (static is the word that comes to mind). There is a significant amount of scripture in Who the Bishop Knows. I like how the author tied each verse into what was occurring at the time. It was lovely to visit Monte Vista and catch up with Henry and Emma. They are such a sweet couple. I have enjoyed watching their relationship develop over the course of the series. I am glad that Henry has learned to accept his gift. The ending of Who the Bishop Knows was just lovely and heartfelt.